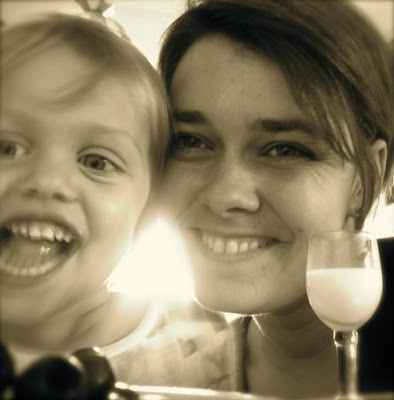 this is me and eliza at a milk and black olives birthday tea party. thanks to so many for making this day a true celebration…i woke to gifts…new perfume, a new mirror, jumbo push pins (which i myself carried around the thrift store before putting down…only for my family to find them for me! ), fancy chocolate, an amazing wooden piece made by my dad, burts bees treasures, greetings via email, yoga cards, cookies, oranges, handmade cards, phone calls, and hints of things to come…34 seems young until i remember my perception of it when i was 20…34 years and life is good…i am carried and settled and grateful. What wonderful treasures you hold there. I hope your days get better and better, and I’m grateful that you share them with us. It sounds like an absolutely beautiful birthday. I hope you were still basking in the love somewhere when I called and left a message! 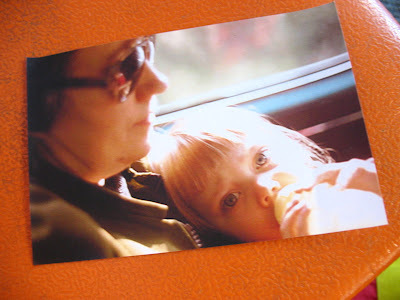 I love the picture of you and your Oma. Isn’t it an amazing thing to look into your own young eyes? What would you tell that little girl if you could? Happy Birthday, friend. Ahhh….interesting to see you too contribute to the bold blondness in your children’s youth. you said thursday, i remember that your birthday is thursday. so happy early birthday. so happy there is you in my world. love, love, LOVE that picture of little you!